AlazarTech was founded with the goal of serving the test and measurement market, in general, and the embedded digitizer (OEM) market segment, in particular, by providing high performance instrumentation products at affordable prices. Muneeb Khalid, President of AlazarTech, was one of the original founders of Gage Applied Sciences Inc., which was sold to Tektronix in 2000. 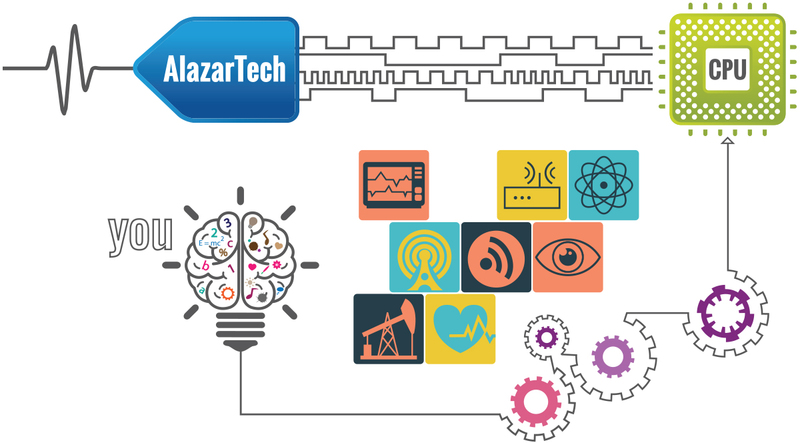 AlazarTech is in the business of helping customers create and measure high speed electronic signals. These signals are analog in nature and, therefore, are incomprehensible to computers. We convert these analog signals into digital patterns that computers can understand and process. These are manufacturers who need to interface their equipment to one or more analog sensors. They may design their own circuitry to do this task, or they may decide to purchase AlazarTech products to do the same task. An example of this would be a manufacturer of medical imaging machines that chose to embed our waveform digitizers to interface their machine to a swept source laser. Our job is to make this build-or-buy decision as simple as possible for our customers by providing high performance products at very affordable prices. Manufacturers who need to test if their product meets its specifications have to exercise their product and make measurements to ensure that the results are within the acceptable range. This is usually done by measuring an electronic signal that is output by a transducer. An example would be the manufacturer of DVD players who needed analog signal acquisition capability to do a final quality control test on the product prior to packaging. Digital oscilloscopes were too expensive as it would have raised the cost of goods beyond the acceptable limit. They chose AlazarTech waveform digitizers and were able to not only do the necessary testing, but also increase their manufacturing throughput. Researchers who need very specific measurement capabilities, be it deep acquisition memory or large number of input channels, need very flexible measurement equipment. We work with these customers to figure out a solution and then implement it. We are focused on designing and manufacturing waveform digitizers, waveform generators, software drivers, integrated test and measurement systems, etc. We listen to our customers, figure out what their problems are and solve them. This age-old formula still works. Innovation and R&D is a way of life for us. If we are not designing a new product, we are thinking about how to improve the existing products and processes. This allows us to always be better than the rest and provide customers with real value for their money. We are always willing to work with our customers to solve their problems. This may include customization of products or even the design of new products to meet customer needs. We offer our customers a mixture of leading edge technologies in analog electronics, digital electronics, software design and system integration. With our Dual Port Memory technology, we allow customers to build real-time systems that can not only be used in the laboratory, but also be deployed in the field. Our unique, low noise, wideband analog design blocks allow us to beat the competition hands down in any face-off. Finally, using our unique asynchronous device drivers, we can make standard Windows and Linux operating systems do things you thought were not possible. We recognize that a company is only as good as its people. We have collected some of the top talent in the test and measurement industry and have brought them together at AlazarTech. Our team believes in achieving a balance between shareholder value, customer delight and employee satisfaction. We also believe that you cannot achieve one without achieving the other two. The environment at AlazarTech is very conducive to creativity and teamwork. We are all open to intellectual challenges and welcome constructive criticism from everybody, because we know this is how we can improve ourselves - both as human beings and as a company. How can AlazarTech sell at such low prices? Over the last decade, the prices of ICs, such as A/D converters and memories, have fallen exponentially, yet the prices of PC Based instruments, which use these chips, has not fallen at all. The reason is simple: other manufacturers charge high prices because they can and it is not in their interest to pass the savings to the customer.